One day, when I was in sixth grade, my teacher brought in an album from his personal collection and played it for the class. I remember it vividly because, seeing as it was a Catholic school, we were normally subjected to religious music or church hymns, but on that day we actually got to hear some rock (and what’s more, it was modern rock). This was the first time I ever heard Meat Loaf’s Bat Out of Hell, and it has since become one of my all-time favorite albums. 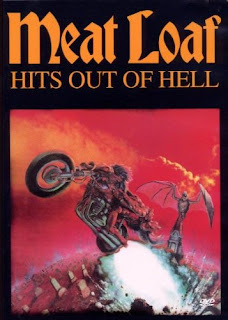 Released in 1991, Meat Loaf: Hits Out of Hell is a collection of nine music videos featuring some of the singer’s best-known tunes (while most of the videos were clearly shot during a live concert performance, the audio is that of the studio recordings). Not all of the songs are from Bat Out of Hell; one of the few non-concert videos (it’s set at a truck stop, with Meat Loaf playing a trucker in love with a waitress) is for the ballad “More Than You Deserve”, which was lifted from the album Dead Ringer. But for me, the best videos in Hits Out of Hell are a trio that I watched regularly on MTV back in the day, all three from Bat Out of Hell. “You Took the Words Right Out of My Mouth” begins with a brief, albeit cryptic intro (“On a hot summer night, would you offer your throat to the wolf with the red roses?”) before launching into what is one of the singer’s best tunes, while the title track for “Bat Out of Hell” is an epic song (over 8 minutes long) about motorcycles and being in love. Topping them all, however, is “Paradise by the Dashboard Light”, which tells the story of a guy so incredibly horny that he makes a vow he immediately regrets. This video, in which Meat Loaf performs alongside Karla DeVito, is a lot of fun, and the tune itself is almost like a mini rock opera (the beat changes several times, giving us what amounts to three songs rolled into one). I have no idea why my teacher decided to play Bat Out of Hell for us, but I’m glad he did (a few months later, this same teacher would go on and on about an upcoming movie that he claimed was going to revolutionize special effects for the screen. The movie was An American Werewolf in London). That random day back in 1981 proved to be one of those defining moments you rarely see coming, and it introduced me to some damn fine music that I still absolutely love.